WASHINGTON — Ballston Exchange, the redevelopment of two Ballston office buildings formerly known as Stafford Place I and II, adds Shake Shack, We The Pizza, Philz Coffee and CAVA to the list of tenants. Ballston Exchange was the former home to the National Science Foundation, which moved its headquarters to Alexandria, Virginia, last year. Shake Shack will be part of 4201 Wilson and will include a patio. We The Pizza, from D.C. celebrity chef Spike Mendelssohn, will also be at 4201 Wilson and will also have outside seating. It will be We The Pizza’s third location in the D.C. area. Its others are on Capitol Hill and in Crystal City. Philz Coffee, a San Francisco-based coffeehouse chain, will be in 4121 Wilson. It will be Philz Coffee’s first location in Virginia. It already has locations at The Yards and Adams Morgan, with another coming to Dupont Circle. CAVA will also be part of 4121 Wilson. The buildings are across Wilson Boulevard from Ballston Common Mall. The mall is undergoing its top to bottom makeover as Ballston Quarter. Ballston Exchange is connected directly to the mall and the Ballston Metro by pedestrian skyway bridges. Atlanta-based developer Jamestown LP, whose other projects have included Ponce City Market in Atlanta and Chelsea Market in New York, is joining the two buildings by a shared “paseo,” or courtyard, that it says will be lined with storefronts, dining patios and public seating. The restaurants announced for Quarter Market include fast casual eateries serving sushi rolls and salads to rustic establishments firing up authentic Italian cuisine. The project is scheduled for full delivery by the end of 2018. 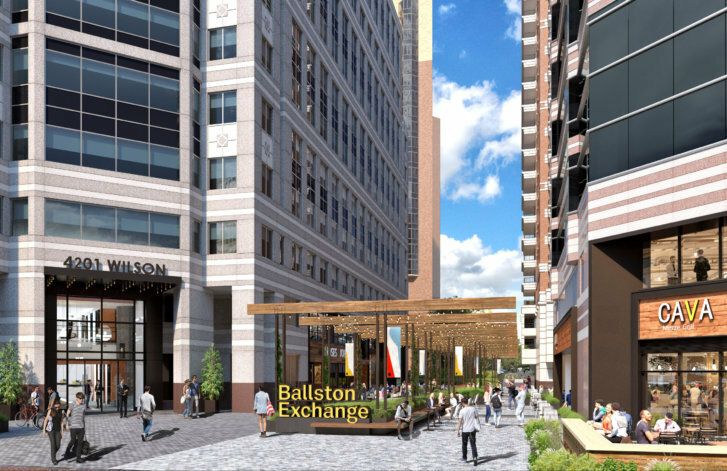 “The addition of these food options and the new paseo that will connect the two towers represent our first steps toward modernizing Ballston Exchange and creating a distinctive space for our tenants and the community,” said Jamestown President Michael Phillips. The two buildings have a combined 776,000 square feet of retail and office space. 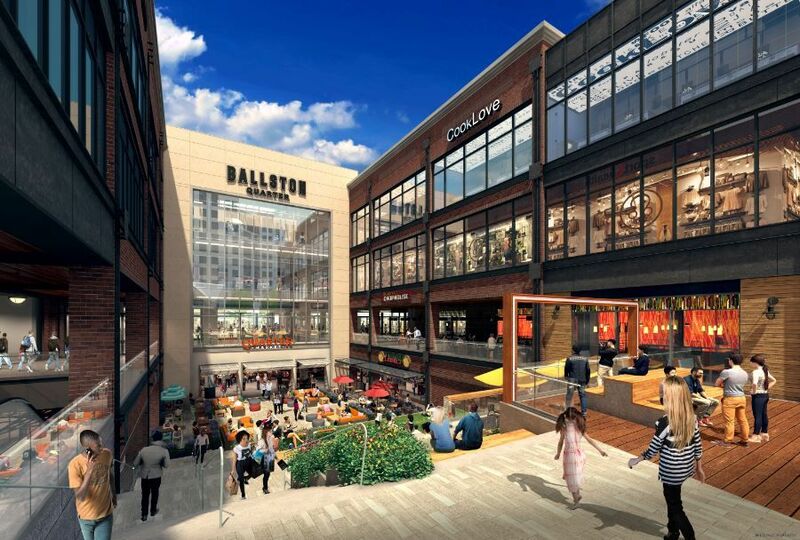 Across the street, developer Forest City’s two-year redevelopment of Ballston Common as Ballston Quarter will include one of the largest food halls in the D.C. area, with 18 food vendors and an outdoor plaza. The restaurants for Quarter Market include fast casual eateries serving sushi rolls and salads to rustic establishments firing up authentic Italian cuisine. Forest City’s 850,000-square-foot redevelopment of the mall also includes a new 22-story residential building.